The origin of the saying, “Live, laugh, love,” often seen as a live, laugh, love wall décor, but also sometimes as a mug, a plate or even a throw or pillow, is an essay by Bessie Anderson Stanley. The first line of the essay reads, “He achieve success who has lived well, laughed often, and loved much.” The saying was incorrectly attributed to Ralph Waldo Emerson in the Dear Abby column and was corrected by a letter from Mrs. Stanley’s grandson, Arthur Stanley Harvey. The saying had also been incorrectly attributed to Robert Louis Stevenson by Hallmark. Since the saying is so popular, outstripping even “Keep Calm and Carry On,” a slogan from World War II, it is easy to become glib about its meaning. Bessie Anderson Stanley’s essay went on, however, to define the qualities she described in her opening sentence. It is entirely possible that Mrs. Stanley was influenced by Emerson and by Stevenson. The philosophy of transcendentalism was well known by 1904, the time of publication of her essay. Emerson did write a paragraph that begins “To laugh often and much . . .” that continues on in a similar vein, but does not use the words live or love. Stevenson wrote a poem, The Lady of the Snows, that has a line “to live, to love, to live, to die.” The tenor of Mrs. Stanley’s poem clearly indicates that she was well-read, so it is entirely possible that she had read both these works, but she is the one who put them together in that significant way and used them to define success. 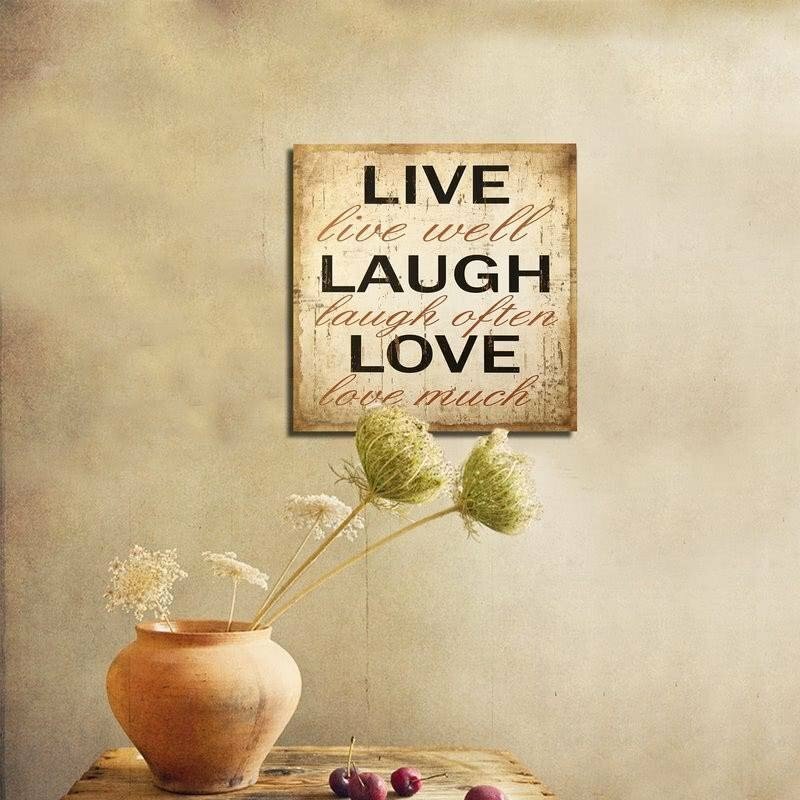 Therefore to display the words, “Live, Laugh, Love” on your wall and to use them as a basic philosophy can be a game changer for your life and for others. Here are ten ways you can share the wisdom distilled by Bessie Stanley Anderson more than a century ago. It is important to be able to relax; this Live Laugh Love piece says it all without many words. It fits well on any beige or sandstone wall tone and has a warm look to it. This shows that the message has been around a long time and can help ease others. At a front door, this piece of décor helps bring the feeling of family and togetherness. With the words “Live Laugh Love” written in this metal piece it brings out enjoyment. Against a light colored or white wall, this piece really stands out and increases its presence. The metal build allows this to be placed outdoors when securely fastened in. The floral additions and the Fleur-De-Les continue to add to it giving this piece a conservative aura. The words “Live Laugh Love” in all of their glory, this set combines them all with a single “L” showing that they are all combined and important to have together. With a copper tone, this works well on any beige or off-white wall to bring out the message of greeting. This piece works well to bring out another metallic décor in the room. This piece brings in a sense of nature with its message of “Live well, Love much, Laugh often” with its grapevine design. Behind every two words is a grapevine end which adds a multitude of messages, often to enjoy. To everyone, this has its own meaning and values. This piece works well to add color and vibrancy to an earthen themed area. This piece of décor has the words “Live every moment, Laugh every day, Love beyond words” bringing a smile to people that gaze on it. It doesn’t try to bring any defined sources that might conflict with the message. This piece has a cloth texture and can stand out effectively on a darker tone wall or brick. The more texture around this piece brings more presence to it. Each piece of this set has an individual word from Live Love Laugh with a candle holder. In the frame are curls of metal with flower petals attached. Having a wall behind this set that has a light tone will add more to the effect of each individual piece. The added candle adds a level of spirituality to this set that increases its meaning. A decal gives you great freedom to put your message on any flat surface, behind a chair, on or over a door, even on the ceiling as long as it is flat. The brighter the surface the more the message stands out. This piece can bring a feeling of relaxation to any black and white themed room without being overbearing. At 22 pieces you get the liberty to define this message more to your style and artistic beauty. With the added flexibility this adds locations of where you can set this decal to have the most meaning to you. A solid white surface or on a mirror works really well to present and enhance the message.